The village is located in an ordinary forest. But it is unusual, it has some bugs - generation of Minecraft PE. The village (snowy forest) seed for Minecraft PE 0.12.1The village is located in a snowy forest. Half Jungle Village seed for Minecraft PE 0.11.XThis seed will open in front of you is quite a rare phenomenon in the world of Minecraft PE 0.11 - a village in the center of the jungle. Island and village seed for Minecraft PEThis is a special new seed with which you can easily create and be on a beautiful island among the vast sea. Medieval village map for Minecraft PE 0.10.5With this map you can be in a very beautiful village, which will be all for a carefree life. 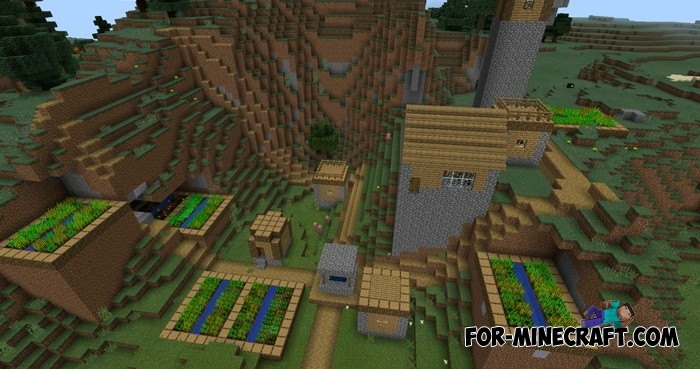 Seed the village "Diamond Falls" for Minecraft Pocket Edition 0.10.0AWESOME diamond seed to the village in Minecraft Pocket Edition! There is also a huge waterfall and a smithy with iron swords, emeralds, apples and more! Tell all your friends, if you like! Thank you!